This morning saw the frost back but it wasn't too bad. We have yet to get a full hard frost but now when we do my Gunnera is ready for it. 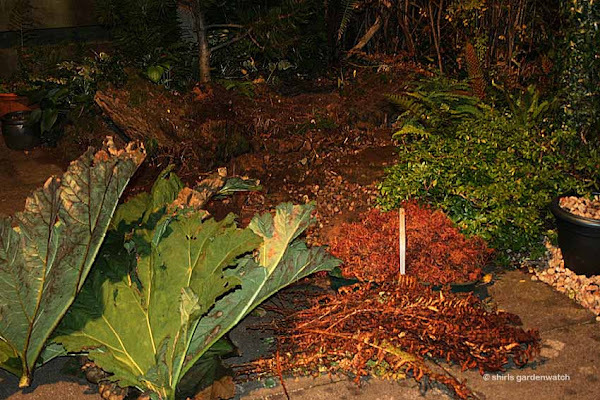 As promised, I have photos and details of what I have done to protect my Gunnera for winter. Although this has been successful for quite a few years now I never assume it will always be so - especially as now our weather is more unpredictable! Looking back to May 31st, shown in the first photo below, you can see how lush this area was looking and how fresh the leaves in my Gunnera were in the dappled sunshine. 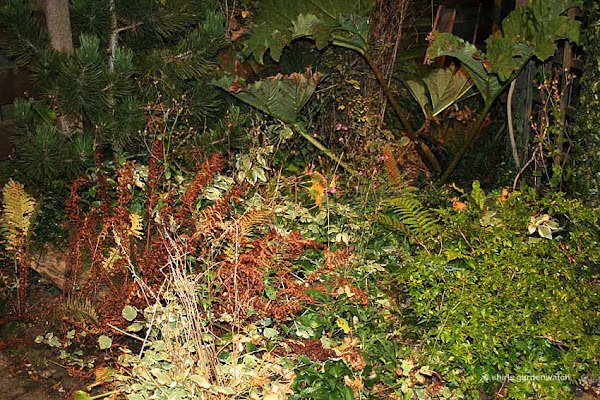 Last Wednesday evening, when I went out to protect my Gunnera plant as frost was predicted, this area looked quite different on a cold night with artificial light. It was a dry night and I would not have done this job had the ground and plants been wet. Many plants were passed their best and the whole area was in need of a good tidy up. I pruned hard and pulled out some plants completely as I was certain with all the seed capsules that many new plants will appear next year anyway. 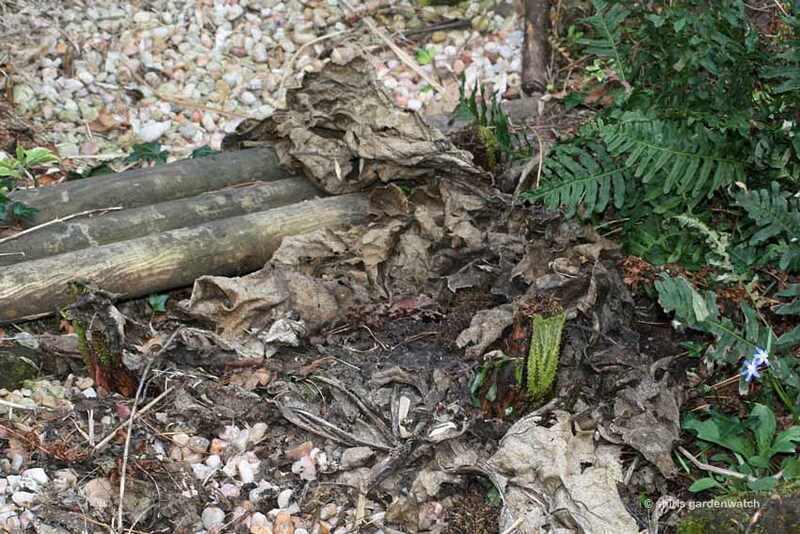 During my tidy up I set aside the Gunnera leaves (with stems cut off) and all the dried-up ferns. Next, I went to my small Acer at my back door and picked up all its dry leaves from the ground and gently pulled off any remaining ones on its branches - they were ready to fall and this also stopped them falling into my pond. I now had all I needed to protect my Gunnera. My intention was to protect the base of the flower. I loosely scattered all the ferns and leaves around the two flower spikes. Now to the fun part... 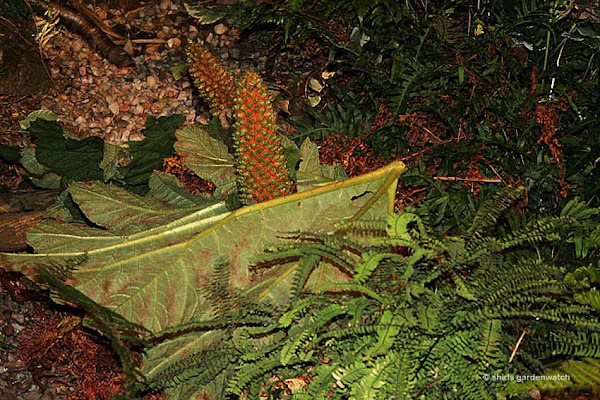 I took the smallest of my gunnera leaves and turned it upside down and pushed it through the centre of a flower spike. I then repeated this using the medium leaves finishing with the largest leaf. You can see just the tip of the Gunnera flower spike now. Job done and this area has had a bit of a make-over too as you can see. Ah... but what about the wildlife that would have been living there pre tidy-up? Well, the upturned Gunnera leaves will probably play host to much wildlife as will the evergreen ferns that grow in this area. I also have a sickly bamboo here too and on another dry day I will pick up leaves (especially the odd fallen sulphur heart ivy ones) and use the bamboo stems like a cage and drop the leaves into its base to provide new winter wildlife homes. Now, as I walk past this border at first glance it looks neat and tidy but at the back and around its edges it still has many homes for wildlife. I also planted my Hellebores, as you can see in the foreground which will feed early insects in Spring. Meantime throughout winter, insects can still enjoy the small pine tree, an ivy-glad rotting tree branch and walkway trellis, a dwarf Rhododendron and some everygreen ferns. Everyone's happy. Okay so what is missing? Perhaps it isn't obvious in the previous photos but my Gunnera isn't growing in water! Gunneras are usually seen as happy at the waters edge of large ponds or boggy areas - but I don't have a large pond or the space to have one. However, after walking under a huge planting of Gunnera at Trebah Garden my daughters were very keen to have them in our garden to walk under. Now, of course, as my plant grew - so did my daughters so they are not likely to walk under mine! I am sentimental about plants though - so I will try and keep this one for some time yet. Turning back to earlier in the year (April 12th 2007) you can see below what this plant was like when I was removing the protective leaves from the previous year. New growth was forcing its way up towards the light. Now you can see the base of the plant much more clearly. You can also see the bottom layer of foliage has withered down too. I always worry frost will get the crown when I remove this to let the plant grow. It's only at this stage you can see there is a gravel path (also with stepping stones) leading down to my Gunnera from each side. It is planted in a small dip which is not perhaps that obvious in this image. I put three poles across to act as a small bridge for my daughters to sit on or balance along when they were younger. Perhaps I should add here that before I planted my Gunnera I put down a piece of plastic from a compost bag - black side up and pierced a number of holes in it. I then added a mix of garden soil and compost and watered it well. 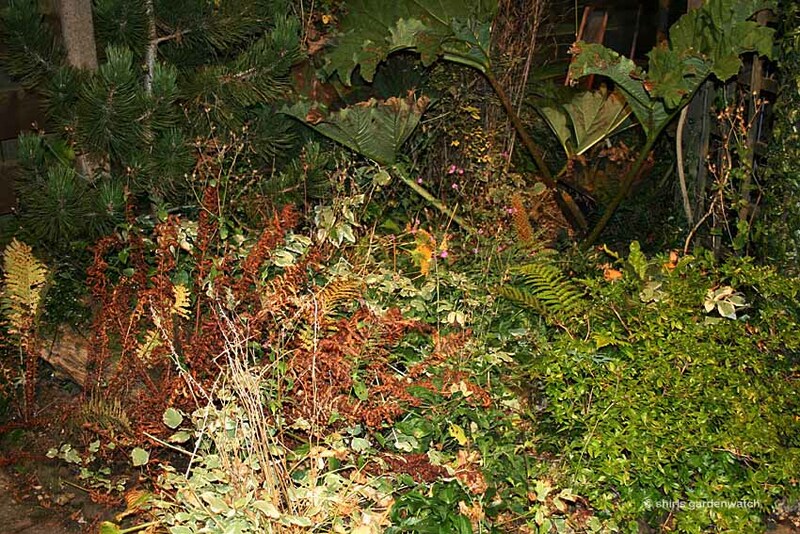 This now acted like a bog garden but only in the area below the Gunnera. In its first couple of years, if we had dry spells, I would throw a bucket of water over this plant and it would collect under the bridge. This Gunnera also grows out of full sun. During the afternoon the leaves do get some sunshine as you can see in my first photo but it seems happy there and has not outgrown its space which is usually a worry to gardeners. 2008 Update:: I protected my Gunnera slightly differently this year. 2009 Update: I protected my Gunnera a bit later than I should have. I used a mix of the two previous years methods to protect it. It perhaps didn't look too pretty but this was a very cold winter and this plant did survive when many other plants did not. Unless otherwise stated, all photos shown above were taken during the evening of October 17th 2007. 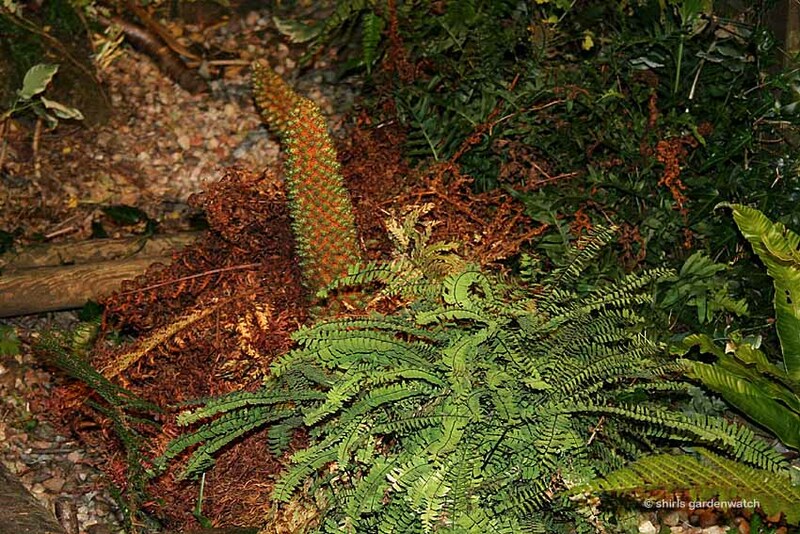 Shirl: I would so love to have a Gunnera! I will visit yours often and who knows, with global warming maybe a Gunnera is in my future. Not hoping for warming too much though. What is your coldest winter temperature? Just wondering. Thanks for the info on your garden clean up and protection system! Tonight I have searched the internet for past temps for my area in Scotland but I know we have it colder than the two closest Met Office Stations. Any info I can find shows the average temps anyway. As gardeners we all know that it’s the coldest temps that kill the plants so an average is absolutely no good! Perhaps the answer is to record my own temps and post them in some way. That would show that my plants survive, or not, in these temps. One winter I did loose a large number of plants and from memory I think our temps went below -10 deg cent to perhaps -13. However, that is not usual but then again neither is the warmer winters we have had in the last few years. Yes, Layanee I will find a way to record my true temps in some way. I would take a guess that a cold winter temp for my area would usually be -8 or -9 deg C. How cold does it get with you in your area of America? Gunnera looks prehistoric to me. I always look to see if there is a dinosaur or at least a dragon lurking around these plants. Shirl, do you wear gloves when you handle the gunnera leaves? I heard that they can give you a nasty rash. Yes, I wear gloves when I handle the Gunnera as the stems are quite prickly. My gloves are usually still on when I handle the leaves so I have never noticed a rash. I will be aware of that now though - thanks! 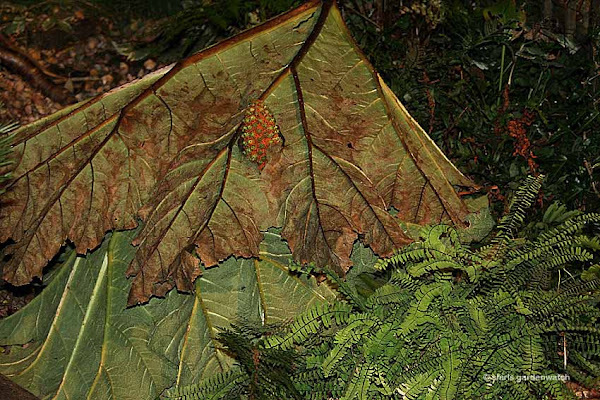 What a great post explaining how to protect your gunnera--or any tender plant that isn't bothered by winter moisture, really. Thank-you. Yes, you are probably right - the shade at the roots at the base of my Gunnera probably keeps it reasonably happy. Planted where any water will run down to it should also help. LOL. Yes I know what you mean about trade-offs - its fun trying though! If your soil is so dry have you ever tried digging a hole/trench and putting thick plastic/pond liner down. You could then pierce holes in it then add a mix of soil and organic matter - even water retaining granules too. 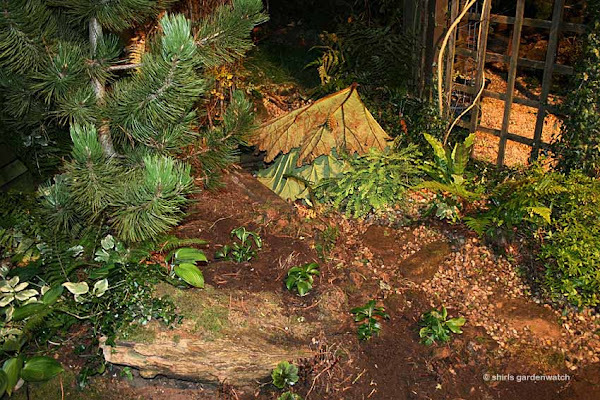 You could than grow more moisture loving plants :-D A dry river bed idea perhaps for under your walkway? shirl, i never used to wrap my gunners up. I live in northumberland, it always sailed through winter. Unfortunatly they have new owners now, as had to leave them behind. Better doing things properly though. 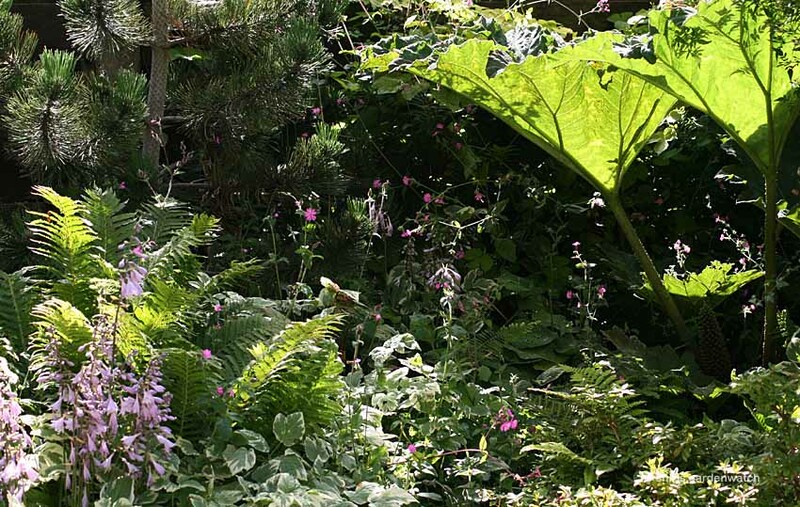 Beth Chatto described this method for protecting gunneras in her garden near Cambridge. I have always done it with mine - I don't know if it would survive here without some protection. I am delighted that my photos have been of help to you. I live in wet South Wales, up a valley! Not much sun, but lots of rain! In Spring/summer 2008 my daughter bought herself a gunnera but didn't realise how big they grew (she has a small garden), so she gave it to me. We have a very big garden. We put it in the sunniest spot. (but only gets sun 50% of the time, because we live in the shadow of a hill/mountain to our West). It grew very quickly! Later in the year the leaves started to get brown/dry/dead areas. Next time we looked (December? January?) there was just a rusty crown! We never covered it. We didn't know we should. Now I look every day, but no signs of any new growth. We have had only a few nights of frost, and very little snow. But haven't experienced any of the severe cold you have had in Scotland. Questions! --> Should I cover it now? Or is it all too late? Or should I just be patient until April? Sorry I’ve taken so long to get back to you. I haven’t been on my blog this past week due to an illness in the family. Ah… covering your Gunnera now may be risky. If it were my plant I’d worry that by putting a covering on it now could increase the chances of the crown rotting. My thoughts are that the crown could be damp at the moment and by putting dry material on top might make it worse at a time when your plant may need air around it. I see from my posting that it was April 12th when I removed my covering. I am guessing that in Wales you could be up to two weeks ahead of my garden. In which case I would leave the plant until the end of the month then gingerly move some of the leaves around the crown to see if there is any new growth. When you see the amount shown in my posting then clear way all the wet rotting stuff and the plant should be good to go! However, if you are lucky and it has survived I would advise protecting your plant in October this year – on a dry day. Good luck with it! Sounds like you’ve excellent growing conditions for a Gunnera. I would also think that as seeing the original plant was divided (guessing) it has been invigorated and should put on good growth. Mine, on the other hand, isn’t in the sunniest spot and hasn’t been divided and I guess as a result hasn’t out grown its location at all! You could say the expression right plant right place is correct for you but you can get round this too with different results as my plant shows. Thanks for reply, Shirl. Don't worry about delay in responding. I've only today looked again at your website! OK. I'll ride this one out. My rhubarbs are all budding up, but the gunnera just sits there and looks at me! I appreciate your advice. Could you please give me any idea of when i can expect to see any new shoots on my Gunnera? I bought it last year and planted it in its current position about October time but never protected it from the frosts. I was wondering if i had managed to kill it off, or is it a bit early for new shoots? I live in the WestMidlands. Update! By the end of April, nothing had happened. The stump was still looking at me, and it had nasty brown slime on the top, but no buds anywhere. And I know what to do before next winter comes. Thanks. Have you any tips in the meantime? Like dividing it up? Hmm. A bit premature I guess! Fertiliser? Any tips will be appreciated, if you've got a moment. Ah… dividing… that I haven’t done yet! However, I do believe the books say to do this after 3-4 years. I have had my plant at a guess 10 years and as it is out of water and doesn’t get baked in the sun all day it hasn’t overgrown its spot yet. I went to the Lost Gardens of Heligan (Cornwall) in the summer. I suspect they keep growing through the winter! Or maybethey are a different species/variety! Anyway, we've had some cold snaps. I neglected to cover my plant in October! So today's the day! (Better late than never) I'll tell you in mid May if they survive! It only took me two minutes! And WOW! I've got three gunnera heads now! They each look very healthy and have new leaves pushing up! It's a sjame the plant doesn't know that winter cometh! But there was half a centimeter of ice on my pond, so all those watery stems will soon perish. They were so juicy too! Just like rhubarb! And I didn't really need to cut the stalks, I could have just snapped them all off, I think. I am a bit aghast at all the enthusiasm for Gunnera!!! I am currently putting together a paper on its invasion & take-over of north Connemara (west of Ireland)!! I kid you not, it can die back in winter with frost, but grows again in the spring. It can be spread by careless gardeners (not you of course!!) chucking it out. But the scary bit is it seems now to have started setting seed. It had completely overgrown a gravel quarry at Letterfrack and was then spread over roadisdes with the gravel -disaster! I have two questions: has anyone seen seed germinate where you live and if so, what kind of winter/spring temperatures do you have? Basically, I want to know if our minimum temperatures have risen to support either germination or seedling growth or both and if so, what IS the minimum temperature its seeds/seedlings can tolerate? Has anyone seen it spreading into the wild by any means) and how much (I think in Cornwall & on the Isle of Man it may do)? My gunnera seems to be growing fine - to the extent that I've needed one of the kids old plastic toy crates rather than the bucket originally recommended by my local garden centre to do the frost protection. Not organised enough to manage the more natural method recommended here! Maybe I might manage in 2011! My plant survived a very cold 2009/10 and may need splitting this time round. I could tell it was time to uncover last year as it started forcing the crate off! I'm fascinated that there's an environmental problem on Harris where I would assume that the climate was much harsher - maybe the Gulf Stream helps? We don't normally get much snow or low temperatures here - either Lincs or Norfolk cops for it, but not P'boro in the middle - distinct lack of high ground to produce snow even when the arctic winds are whistling in from The Wash!